This sterling silver 20th century dresser set survived three generations but needed a great deal of restoration. This set included a mirror, nail buffer, brush, cuticle knife, button hook and shoe horn. (There was no comb or dresser set lids.) Every single piece required an extensive amount of work. This customer was interested in restoring this dresser set for future generations. In the images and text below, I will show you before and after images for this dresser set, and describe the restoration work involved. Restoring dresser sets is very time consuming requiring patience and time. It usually takes a couple of months or more and $100’s of dollars for each item. 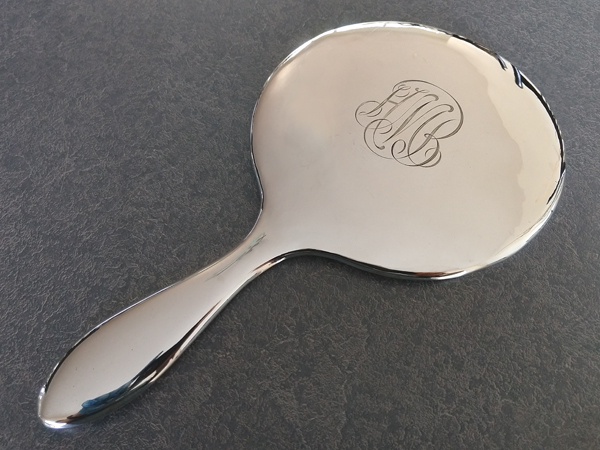 The mirror back was wrinkled and dented both on the back surface, at the top of the handle and along the edges. This 20th century dresser set mirror smooth surface means that every imperfection shows. It took a tremendous amount of work to get it this smooth. 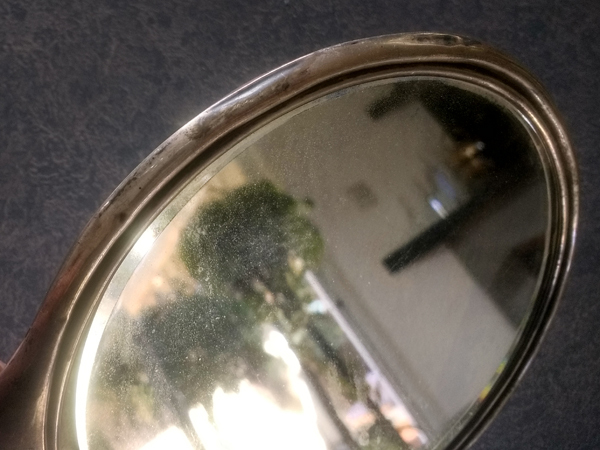 The edges of sterling silver antique and vintage dresser set mirrors are often badly dented. In this case, the seam along the edge was also split and had to be repaired. The back of the mirror was very badly dented with sharp dings. Sharp dings are very hard to remove. The smooth surface of this mirror made every imperfection very obvious. Old dresser set mirrors often are often cloudy or scratched. 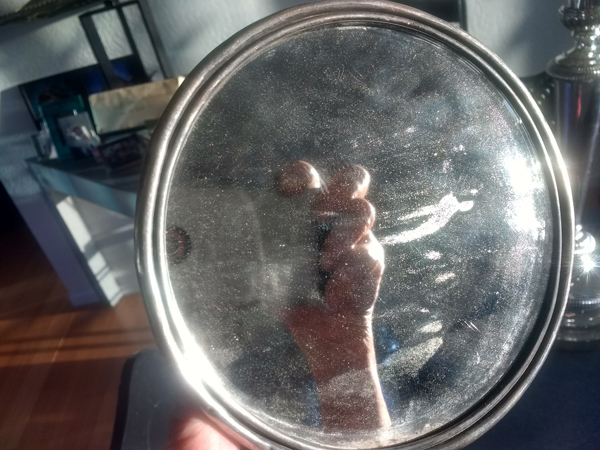 Instead of replacing the mirror, I recommend taking out the mirror, and having the mirror re-silvered. New mirrors are very expensive and look inappropriately new and too perfect. The mirror in this photo looks flawless - it is not. Even after re-silvering the mirror, there are always ghosts, or imperfections in the glass or scratches in the surface, but the mirror has character suitable to the age of the dresser set. This sterling silver buffer arrived bent out of shape, dinged and missing the buffer block and chamois. In addition to hours of reshaping the sterling silver buffer, I had to carve a new block of wood and cover it with chamois. Most buffers have a matching box so it sits upright. This was missing. In this photo you can see the nail buffer completely restored. It took hours to shape the silver, carve a new wooden block and cover it with chamois. Below the nail buffer is the matching shoe horn, cuticle knife and button hook. 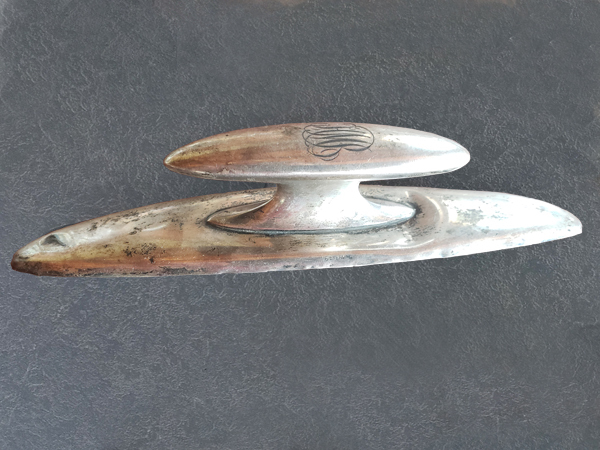 This sterling silver shoe horn arrived with the original steel shoe horn, but it was incredibly rusty, deeply etched corrosion had eaten into the metal. The shoe horn was so rusty that it had also eaten into the edge, so I had to reshape the steel into a uniform shape. The customer wanted to use the original shoe horn, so this involved hours, and hours of grinding and buffing the steel shoe horn. It looks amazing, but I would have doubted this was even possible. and do not promise perfection. 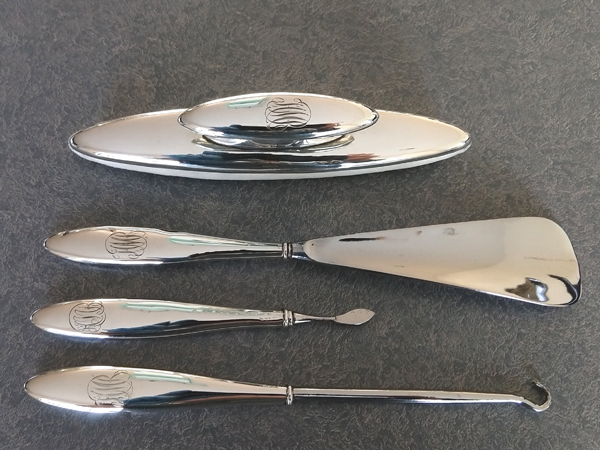 The dents in the sterling silver handle (left photo) can not be removed because the neck of the handle is too narrow. This sterling silver brush was dented and missing the brush. The dents and wrinkles were removed best possible. Sharp dings are difficult to impossible to remove. Wrinkles and dents must be rubbed out very slowly and carefully. The smooth surface of the fitter is like a mirror, every flaw shows. 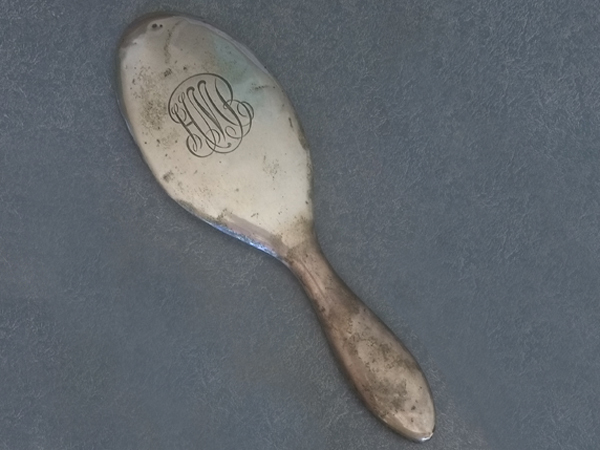 I do not polish the monogram. Dents in the handle usually can not be removed, or only to a limited extent. The silver brush fitter was also cracked at the bezel and had to be soldered. Any soldering on the sterling silver fitter means the pitch inside the handle must be removed. (Left photo) After the dents and dings were removed from the sterling silver brush fitter the cracks in the edge were soldered. 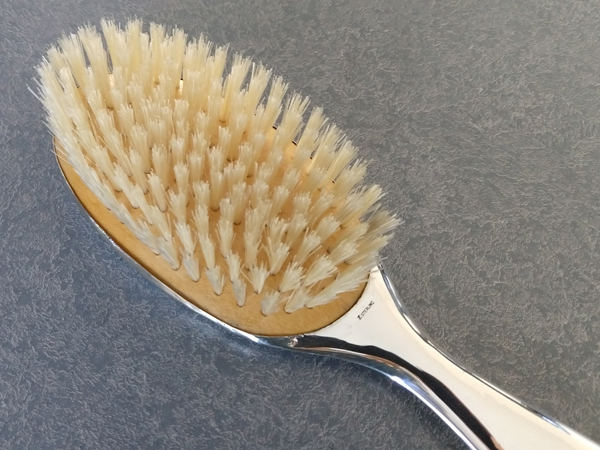 Then the brush is sent away for a custom made brush (right photo.) This takes about a month. When the sterling silver fitter comes back, the handle is refilled with pitch and the brush is set into the handle. Allow at least 2-3 months for this type of restoration work.